I wanted to share a piece of good news with you. Yesterday, my husband and I were in the Bronx and walked by a live poultry market. I looked closer and saw something round and white running and trying to go under the wire gate. As we walked closer, I told my husband, “It’s a hen! We have to save her!” I went up the stairs near the entrance of the horror house and quickly looked around to see if anyone was looking for her. A worker came out but didn't seem to care or notice his missing moneymaker running outside. Another woman came out and stood by her car as they slaughtered some poor innocent in that place and watched us. By now, the little hen was peeping and very nervous. She wanted to go back inside, but I blocked her. Andrei my husband caught her and she struggled a little, but when he began petting her tiny pink comb and neck, she closed her eyes and ground her beak; she was so tired and hungry. All I had was a piece of bread in my purse, but she couldn't eat that. 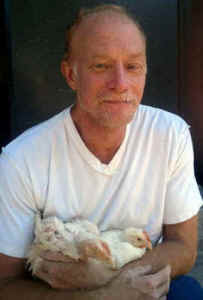 We quickly walked away from the market with the baby chicken in Andrei's arms. I called my friend Jim and before I could explain, he said, “Bring whoever you have over.” My voice gave it away! We brought our new friend to his place and introduced them. Jim had recently rescued another chicken from a local market, but had to amputate his foot due to gangrene. His name is Chick Boy. So we named our chicken Chicklit. She quickly made friends with Chick Boy. Jim called last night and said that in all his time with birds, he'd never seen anyone as hungry as Chicklit. He said, “She looks like she has another chick inside of her, that's how full her crop was after dinner.” Chick Boy and Chicklit fell asleep beak to beak facing each other and quite content about the whole day. We’re so grateful to have been able to rescue and give love and a home to these precious chickens. – Sarah Anikin, Andrei, and Jim, September 19, 2011.